Put yourself in this situation: you’re a young boy being driven by your parents up to enroll in an exclusive prep school – a school that every boy for many generations of your wealthy family has attended, and of which “three graduates … have gone on to become president of the United States.” There is only one problem, however. You failed to pass the entrance examinations. Your parents have considered your passing the exams as a foregone conclusion – so much so that they didn’t even notice that no official notification of your test results had ever been sent to them. Of course, the notice had been sent – and included heartfelt “condolences” from the headmaster, a personal friend of your father – but you had intercepted it, tearing it up to postpone the horror of your parents’ discovery of your failure. This is the situation that young Eli Remenzel finds himself in, and it provides the backdrop for the short story by Kurt Vonnegut titled “The Lie.” The story isn’t really so much about Eli Remenzel’s dilemma as it is about the concept of wealth and privilege. On the drive up, Eli’s father (a doctor) is adamant about his son’s not receiving any special treatment at the school. This is in response to his wife (described as an “ambitious” woman with no money of her own, and “openly curious and enthusiastic” as to the ways of the rich) asking if Eli would have a fireplace in his room. She’s also curious as to how many Remenzels have attended Whitehill, i.e., “Is Eli number 31?” etc. Doctor Remezel is annoyed with her constant questioning. Later, when “the jig is up” and Eli’s secret is being discovered via the headmaster’s gentle, embarrassed attempts to tell the doctor, Sylvia (the mother) is the first to realize what’s going on and sympathizes with her son, who moments ago had bolted from the room when faced with imminent discovery. “We’ve got to find Eli,” she says. “That is the first thing.” The doctor, however, disagrees. “The first thing is to get him admitted to Whitehill.” While Sylvia searches for the boy, he proceeds to try to use his influence to get Eli admitted anyway – just the opposite of what he has been preaching about ‘special privileges’ the whole story long. Upon being refused special treatment, he realizes that he was wrong to try, and admits as much to his incredulous son (“A Remenzel has asked for something special! ?” says a disbelieving Eli). This story was only twelve pages long, yet Vonnegut crams a lot of story into a few pages, much like many of the stories in this book. Highly recommended. What are three les told in the story The Lie? Genuinely when someone doesn’t be aware of after that its up to other people that they will assist, so here it happens. Hi Jay, thanks for finding and following my blog. 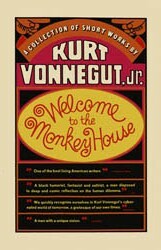 I am sad to say I haven’t discovered Vonnegut’s short stories, will give them a go.